Captain Chaim Shacham, a licensed Master Mariner, with over 45 years of experience in the Maritime /Shipping /Transportation Industry. This experience was gained during twenty (20) years of Merchant Marine sailing, last of which, eight (8) were in command of various types of vessels, followed by twenty five (25) years in various progressing Operations Management positions, ending with his most recent role as the Senior Vice President Operations for a major global Ocean Carrier, a position he held for eleven (11) years, being in charge of all facets of Operations - Ports, Marine, Terminals, Procurement, Project, Break bulk, awkward and Hazardous cargo - in the Western Hemisphere. Captain Chaim Shacham is now offering his vast experience, knowledge and expertise in the various fields of the Maritime / Shipping / Transportation Industry as a freelance consultant to various pertinent parties in the Industry. A comparative analysis of port services vendors covering ports in Canada and US East coast. The execution of a shipment of Project Cargo from a port on the US West coast to a port in South America. A detailed report of Intermodal Land Transport options available for Ocean Carriers / Shippers / Ports covering the US and Canada East coast to final destinations in the US Midwest. An in depth SWOT analysis and comparison of various ports' facilities on the US East Coast. Captain Chaim Shacham at the 2014 Trans Pacific Maritime (TPM) Conference at Long Beach CA, on Tuesday, March 4, 2014, speaking on the panel "Terminal Productivity and its impact on the Supply chains", presenting the issue from the perspective of the Ocean Carrier. 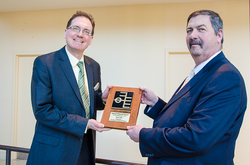 Captain Chaim Shacham receives the 2014 Plimsoll Award for innovation on behalf of Totem Plus Ltd., from the Editors of the Professional Mariner magazine, during the Connecticut Maritime Association 2014 Shipping Conference, at Stamford CT on Tuesday, March 18, 2014. 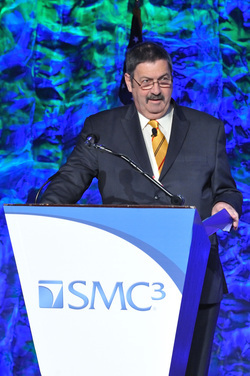 Captain Chaim Shacham at the SMC3 59th Annual Connections 2014 Supply Chain event at Naples FL, on Monday, June 23, 2014 presenting "When Every Penny Counts - Understanding the New Landscape of Ocean Transport". 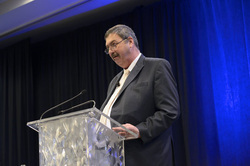 Connections 2014 included individual presentations by six industry thought leaders. James Welch, CEO at YRC Worldwide, addressed the expectations and major factors influencing the trucking industry including the outlook on pricing, capacity, growth and profit. Rick DiMaio, VP Distribution at Office Depot provided a first-hand look at laying the groundwork for being truly omni-channel, while Brian McKiernan, SR VP Development at CenterPoint Properties discussed a new formula of flexible design to meet warehousing's long-term needs. Additional thought leaders included industry consultant and former Zim executive Captain Chaim Shacham.